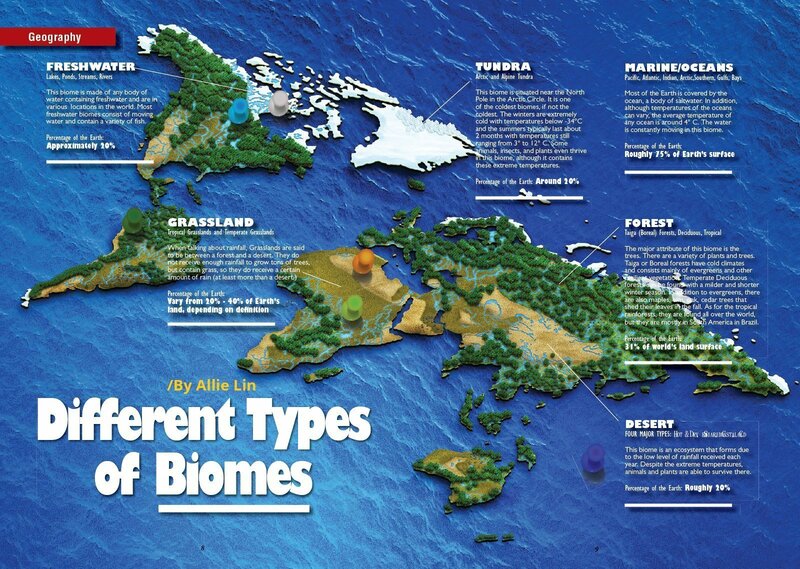 What Defines this Biome/Features that Make this Biome Unique: This biome is made of any body of water containing freshwater and are in various locations of the world. Most freshwater biomes consist of moving water and contain a variety of fish. What Defines this Biome/Features that Make this Biome Unique: Most of the Earth is covered by the ocean, a body of saltwater. In addition, although temperatures of the oceans can vary, the average temperature of any ocean is around 4° C. The water is constantly moving in this biome. What Defines this Biome/Features that Make this Biome Unique: This biome is situated near the North Pole in the Arctic Circle. It is one of the coldest biomes, if not the coldest. The winters are extremely cold with temperatures below -34°C and the summers typically last about 2 months with temperatures still ranging from 3° to 12° C. Some animals, insects, and plants even thrive in this biome, although it contains these extreme temperatures. What Defines this Biome/Features that Make this Biome Unique: This biome is an ecosystem that forms due to the low level of rainfall received each year. Despite the extreme temperatures, animals and plants are able to survive there. What Defines this Biome/Features that Make this Biome Unique: The major attribute of this biome is the trees. There are a variety of plants and trees. Taiga or Boreal forests have cold climates and consists mainly of evergreens and other resilient vegetation. Temperate Deciduous forests can be found with a milder and shorter winter season. In addition to evergreens, there are also maples, elm, oak, cedar that shed their leaves in the fall. As for the tropical rainforests, they are found all over the world, but they are mostly in South America in Brazil.